The original Piña single story adobe is shown with the wooden second story addition added by D.D.’s Phillips’ shipwright brother. Our name reflects the historical tie to our vineyard that was initially purchased by our ancestor Duvall Drake (D.D.) 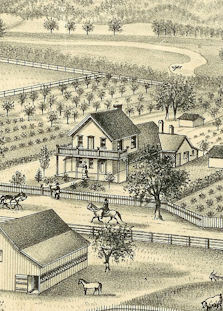 Phillips in 1856 – the first generation to live and farm in Dry Creek Valley. D.D. was born in Kentucky in 1822 and raised in Missouri. He married his true love, Amelia, in 1843 but sadly, she passed away in 1847 after only four years of marriage. Despondent, D.D. joined a military unit and fought in the Mexican War. Having expanded his horizons during his time in the Southwest, he immigrated to the gold fields of California to seek fame and fortune. Working in the Gold Country whet his appetite for better land to farm. Traveling the state to find that land, he fortuitously found property for sale in Dry Creek Valley in Sonoma County. The land was originally part of a Mexican land grant known as Tzabaco Rancho, owned by José German Piña. Upon purchase, D.D. quickly devoted many acres to field crops as well as vineyards and tree crops and in doing so, began a tradition of farming that has continued through five generations. D.D.’s son, Oscar Frederick “Fred”, the second generation, grew up on the ranch and purchased additional property in 1901. His son, Harold Frederick Phillips, the third generation, raised Patricia Kay Phillips, the fourth generation, who later married Don Schmidt. Patricia and Don were wed on the ranch in 1943 and over the course of their 55-year marriage, lived and worked on the ranch, where they raised their three children, Diane, Brian and Kay. Brian married Janice Osborne in 1979 and together they have raised their family while managing the vineyards, following the tradition that began over 150 years ago. More information about the history of the family can be found at the Tzabaco Rancho Vineyards website.